Remote jobs are increasing in every industry as this is beneficial for the company, employee and in the long run for the environment as you cut down on the travel. Why look for Remote jobs? I am a big advocate of remote jobs because there are so many benefits of choosing remote work as compared to a desk job. The most significant factor is the flexibility to work at home. Being able to work in a comfortable environment can help increase the productivity and quality of work. The other things which also matter to a greater extent are cutting costs for commuting, saving time, staying away from office politics and finally having a great balance of work and family. Below are the most in-demand remote jobs from home with average income (US) per year. This is the most advertised remote job because of big rise in customer-facing roles. Chances are if you are new to remote work, you will find ‘Customer Support Rep‘ or ‘Customer Service‘ jobs a lot more than any other jobs. These roles involve communicating with clients or customers over phone or email, resolving their problems and a thorough knowledge of the service or product. These are most suitable roles for students looking for flexible online jobs. Companies like Williams Sonoma, Amazon, Hilton, KellyConnect have these positions regularly available. As a blogger, you can share your passion through your writing, and this is an excellent way to work from home. According to this report, the estimated number of bloggers is going to reach over 31 million in 2020. And, this explains the demand this job has. As a blogger myself, I honestly feel blessed to have a full-time income from home, working around my family. Sharing your views and helping others through your writing is the key to be a successful blogger. Go ahead and start this remote job. Average Income – It entirely depends on your niche and your strategies. I started earning around $300 in the 3rd month of my blogging, and now I make more than a full-time income. Many transcription companies hire remote transcribers. Transcription is the most wanted remote role because of the flexibility and the ease to get into this career, even if you are a beginner. There are different types of transcription jobs like general transcription, legal transcription, and medical transcription. All of these require a bit of training, so if you are good at typing, then this could be the remote job for you. Companies like Scribie, TranscribeMe, GMR Transcription, etc. all have remote transcriber roles. Some may pay well, and some are just for beginners with low pay. Average Income – Depends on the type of transcription you do. Medical Transcription pays around $54,000 a year. Editing and Proofreading are different, but the need for both the roles is immense, especially in the telecommuting industry. Though these terms are used in the same sense, both editing and proofreading are slightly different nature of work on a written piece. As an editor, you help structure and align a written document. An editor must have a keen eye for detail and considerable experience in the field when working for remote companies like Editfast, Cactusglobal, Scribendi, etc. Average Income – According to ZipRecruiter, average remote copy editor salary is around $58,000 per year. Do you know that knowledge of other languages like Chinese, Mexican, Spanish, etc. can become a great remote career choice for you? Being bilingual has its own advantages in landing remote translator jobs. This is a very niche job that is growing pretty fast. Though a relevant qualification in translation is not required, it surely helps to have one. Companies like VerbalizeIt, Gengo, TextMaster, LanguageLine Solutions hire translators regularly. You need to take tests to prove your translation abilities, and for some companies, there is a background check before getting recruited. Average Income – A remote translator earns around $71,000 per year. As a Software Engineer, you might be working on different platforms connecting the client’s needs to the product, but the basic foundation is, having the knowledge of programming. I have personally seen a massive spike in Software Engineer roles in remote IT jobs. This shows how the technical jobs are gaining popularity in the telecommuting industry. Remote companies like Github, Toptal, Hotjar and many more have these vacancies regularly available. Tutoring has evolved into a new phase where you can teach simple English to Chinese or Japanese kids remotely. This is known as ESL Tutoring (English as a Second Language). ESL teaching is becoming the most chosen remote work for many who want flexibility and earn good money from home. In fact, this is becoming very popular among stay-at-home moms who want to earn money from home. The two most trusted ESL tutoring companies are VIPKID and Qkids. There are others like DaDa ABC, Landi, HAWO that also hire remote English tutors. Some of these companies ask for relevant qualification and prior experience, but most of the time an informal experience is sufficient. Average Income – ESL tutors earn around $22,000 to $36,000 per year. Freelance Writing is another growing telecommuting job that has a creative side to it. Over the last decade, there has been an increase in digital publications and so did the demand for content creation. Today, writers get hired regularly for prominent publications like HuffPost, Forbes, Inc.com, and they pay really well. To become a freelance writer, you need to first market yourself and zero down on a niche. Niched writers are more in demand than someone who writes about everything. It’s about authority and expertise. Networking and promoting yourself (with a personal website) are essential to get regular projects. You will find many remote writing jobs on specific boards like Problogger and BloggingPro. Average Income – The income varies a lot depending on the experience and the niche you are in, but the average is around $54,000. Another remote technical role that is seen a lot on job boards is System Administrator. This is again a very niche specific role that needs a background in engineering and good experience in computer operating systems. Resolving help desk issues, monitoring daily performance and usability issues, checking databases, updating software, etc. all come under the general responsibilities of a System Administrator. You can find many System Admin roles on job boards like FlexJobs and VirtualVocations. Average Income – According to Indeed.com, a systems administrator earns around $80,000 per year. If you are the creative type and lean towards design, then Graphic designing is another choice that has high demand. It is a creative and high-pressured remote job that has seen a lot of growth in the last few years. Having a relevant degree is preferred for this remote job. Basic knowledge of web design, Adobe, and other creative software is essential along with HTML/CSS. Graphic Design jobs get advertised on job boards like SmashingMagazine, Authentic Jobs, etc. You can also go in freelance route and secure high paying projects in places like Fiverr, 99designs, Upwork, etc. Average Income – A remote graphic designer earns around $46,000 per year. Bureau of Labor Statistics expects Software Development to grow by 31% by 2026. Though the roles of Software Developers and Software Engineers sound the same in layman terms, Software Developers are the key drivers in the development of a new product. They closely collaborate with the programming team and oversee the development life cycle of a product. The developers’ research, test and design new software. The candidates should be having good leadership and communication skills as they have to provide technical guidance for the whole process. This role demands a lot of prior experience with a thorough knowledge of computer languages and a relevant degree. Average Income – Median Salary for Software Developer in the US is around $101,000 per year. As a social media consultant, you must be great in marketing and also have a good knowledge of social media developments. The job involves handling social media marketing, enhancing the online presence and interacting with potential clients or customer on social media platforms. As a social media consultant, you will also have to come up with new ideas and projects to run campaigns and grow the social media following of the company. Though this role might not need a specific study background, a public relations or marketing degree can be helpful to land the job quickly. Average Income – According to Glassdoor, a social media consultant has an average salary of $25,000 per year. This again is a very in-demand role and is seen all over the big job boards like Indeed.com, Monster.com, etc. Sales representatives can be categorized into inbound sales or outbound sales. Sales representatives aid in selling products or services and taking care of customer complaints and issues. This role needs a lot of experience in selling and negotiating. Having strong time management skills are helpful to reach specified targets in this role. Here are some of the latest remote sales representative remote jobs. Average Income – Average salary of remote sales rep is $59,000 a year. This remote job is growing by leaps and bounds and has given a lot of freedom to online job seekers to work from home. There are many industries you can serve and many services you can offer as a Virtual Assistant. They range from office admin work, email management, social media scheduling, content creation, proofreading, taking calls, etc. This job is very popular among remote workers because this is one job that you can comfortably do from home or anywhere. If you want to be your own boss and start taking clients on your own, you can charge around $35- $50 per hour. It might not take much expertise or experience to start this job, required training to understand the job role, services you can offer and how much you can charge can be helpful. Average Income – Average income of a VA in the US is $22,000 a year. Do you love to plan traveling and all the minute details of the upcoming trip? If this is you, then being remote travel agent is your type of job. Travel agents have evolved over the years from just booking tickets online to carefully crafting the best travel experience for clients. A good understanding of destinations, deals and flights are necessary to give the best to this role along with excellent customer service skills. You can start your travel agency or work for companies like World Travel Holdings, Hilton, Marriott, Carnival Cruise Lines, etc. Average Income – Median salary of corporate travel agent working from home is around $54,000. Are you ready for remote jobs? I know it sounds exciting to go for any of the above jobs (if you have the necessary qualifications) because of all the perks of working remotely. But before you jump in, think hard about working from home every day. Though the flexibility and freedom to work anytime you want is the best feature of remote work, it is not everyone’s cup of tea. I love working from home as a blogger. I have friends who work in the corporate world, and they cannot do this every day, their work suffers if they work from home. So, it’s up to you to decide if this is the route you want to take because if you do, then there is no shortage of money or the quality of jobs in remote working. 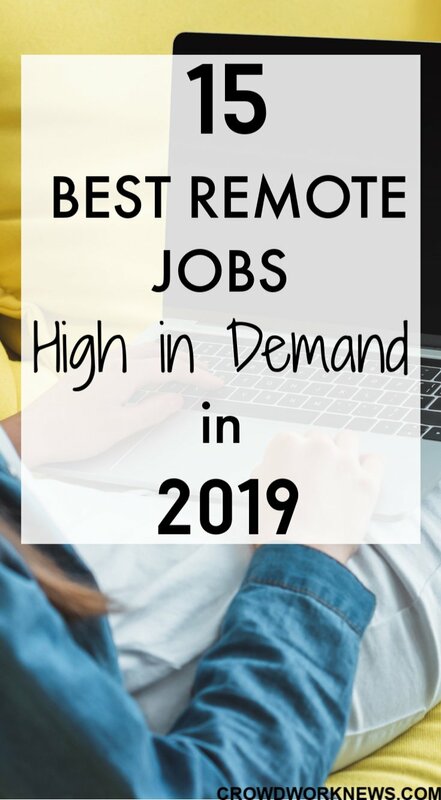 I hope you find the job you are looking for and become a remote worker this year.